MySurvey.com Reviews - Legit or Scam? MySurvey.com Reviews – Legit or Scam? MySurvey.com is the online home of MySurvey, a company that says they want to provide people with a simple and easy way to earn rewards from the comfort of their own home. MySurvey is a part of the online market research industry, which is one of the oldest and most popular ways to earn money online as it doesn’t really require much time or effort. Participants are simply asked to answer questions about their daily lives, habits, and opinions. To sign up as a MySurvey.com member, all you have to do is go to their website and fill out their required registration form. Their website says that membership always has been and always will be free. Whenever a new survey or other market research opportunity becomes available that you qualify for, this company will email you. In addition to surveys, this company says that members may be asked to complete product tests or provide product diaries. None of the activities that are offered to their members should take significant amounts of time or effort, and each activity will be accompanied by an amount of points that you will be awarded once you have completed that task. This website says that after their members accumulate a certain amount of points, they will be able to redeem for items in the Rewards Catalog. These include e-certificates, gift cards, and vouchers to retailers like Amazon.com. The most important features to look for in an ethical online market research company is that they do not charge their members any fees to join or receive surveys and that they provide their members with a low enough payout minimum that they are actually able to get compensation for their efforts. MySurvey.com does not charge members any membership fees, but unfortunately they do not appear to provide publicly published information regarding their minimum cash our requirements. This may be because the requirements change over time or simply because customers will simply save their points until they are ready to redeem them for the item they want. There are some other issues with this company however. Even though they have been around for many years, their customers regularly complain that this company has issues with their IT. Many customers complained that they were in the middle of the survey when it froze or they were otherwise unable to complete it, or that parts of questions or answers in the survey were just missing. When you have these kinds of issues with a survey, it generally means that you will no longer be able to get credit for taking that survey, which is obviously very frustrating and makes it difficult to earn the points you need to actually receive your compensation for your work. However, since it is a free service, customers are welcome to sign up for this website and see for themselves whether they have any problems or issues. Average Rating for " MySurvey Reviews " is 1.96 out of 5 based on 123 reviews. These people think nothing of wasting your time for a payout of pennies per hour. More than half of the surveys, will dump you - but not after taking basic info and wasting your time!!! Try them if you hate yourself. It Is terrible I wait for 4 monds I send a lot of mails but no ansers . Enquette that I make no points . When you have enquette you see an error no points. What is happend there . I am pissed off. I completed a 7 day survey which was supposed to reward me 400 points. At the end of the 7 days, I clicked on "Submit" and the survey tossed me out and never rewarded the points.I submitted a request to My Survey and they said it would take 6 weeks to review and if I did not hear from them, I would never get my points. The points would have led me to get a reward! THIS IS A COMPLETE SCAM. DO NOT SIGN UP FOR THIS. This site is one of the worst survey sites that I have joined. Every survey that is completed results in error messages. Emailing customer service is useless because of the canned responses that are given. Survey takers are never given their points and all of the emails are marked solved without points given. Over the last year I have received zero (0) points for all of the surveys that I have taken. There are seven requests submitted to them to get my points and all of them except one has been marked "Solved" but no points were given. It takes too long to cash out for a simple $10 gift card. It has been a year and I have no points to show for all of the surveys taken. One time had to contact the BBB due to the shady tactics of MySurvey. The odd thing is that when you don't qualify for a survey the site works great and you get the so called sweepstakes entries, but when you actually complete a survey there are all kinds of error messages. This is done on purpose, the site gets there money and you get NOTHING. Also has anyone won a sweepstakes from MySurvey, NO THEY HAVE NOT, THE DO NOT EXIST AND IS JUST A SCAM. DO NOT JOIN THIS SITE, IT IS A SCAM. The site gets paid but you don't. The bogus sweepstakes are just another scam and the entries are junk. This company should be reported as being scammers, think they are part of Lightspeed. I urge everyone to report them and get them shutdown. I signed up with My Survey about 2 years ago. It takes 1000 points to earn $10. Each survey was worth very few points and took forever to reach 1000 points. 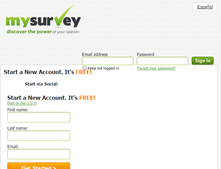 I was also doing surveys for Opinion Outpost which seemed like the website was similar to My Survey. For Opinion Outpost you need only 100 points for a reward or $10 to paypal. I unsubscribed to My Survey. I would not recommend signing up with My Survey. It never awarded me for completing a survey, I got ZERO from them, and they will not stop emailing me. I have gone in and unsubscribed - but was told it takes 2 to 3 weeks before all the emails stop. 2 months later, they hadn't stopped, so I logged back in to ensure I unsubscribed from everything. I was already unsubscribed, but logging back in reactivated my account and I started getting tons of mails again. I am finally down to 4 emails a day - but I will likely have to delete my email account.... SCAM!!! 90% of the surveys either do not work or reject you at the very last question after stealing your time. I completed a three part survey which lasted over three hours and was supposed to give me 1500 points. I completed the survey and receive no points. I queried this and after more than 2 weeks they responded advising me to wait ten days, then told me I did not complete the survey. I did complete it and receive the satisfaction survey at the end. They are thieves and hardly give any rewards. Have used this site for years.This site is getting worse.Every month I have a least I survey that I get no points.Customer service does not exist.Slow load times. Was a member for many years, before the merge with Lightspeed even... And as a mom of two special needs kids, couldn't do the surveys all the time and would usually do them around once a week. Completed a long survey with a large points reward for allowing them to access my webcam and record my reactions. Then just as I was suppose to get the points and could cash a small amount out, they closed my account with no e-mail and no reason as to why! They have become nothing more than a scam! Go elsewhere!